Other than writing about some adventures we take around town, I haven't written much about the uniqueness of where we live: Columbus, Indiana. While in some ways, it's an average town in the middle of southern Indiana, in other ways, it's very "unexpected" (a word I'm stealing from its tourism tagline!). It is ranked 6th in the nation for outstanding architecture (behind Chicago, New York, Washington DC, Boston and San Francisco... pretty good company). There are architectural tours offered daily around town, and it's not unusal to see tourists milling about taking pictures as we make our way into the library or ride our bikes downtown. But we try not to just let outsiders enjoy all these beautiful buildings and public art. While I'm no student of architecture, I love the variety you see around town, the innovativeness, the fact that even our jail looks like a fancy hotel. 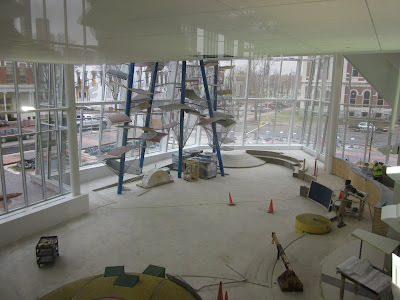 Next month, The Commons will open. 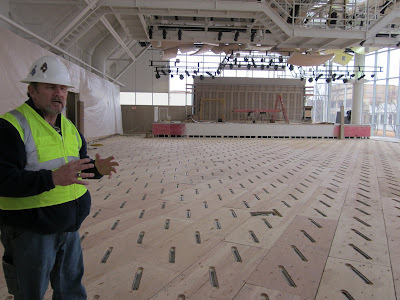 Two months ago, while it was still very much under construction, I got to get a sneak peak during a tour of this amazing new community center. I wrote about The Commons opening for the Indiana Insider a few weeks ago. 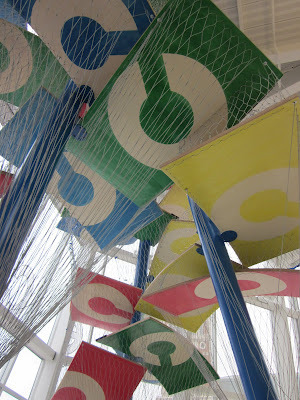 In this post, I mention that I'm particularly excited for the indoor playground, the performance hall and the unveiling of Chaos. Here are a few photos of what will be the playground area when it opens next week. I have no doubt than an enormous indoor playground will dramatically affect our quality of life in those cold winter months. The concert space will be a wonderful resource for our community. I can definitely envision some date nights here to listen to live music. Just like the playground, my favorite feature is the floor to ceiling windows. So much natural light. 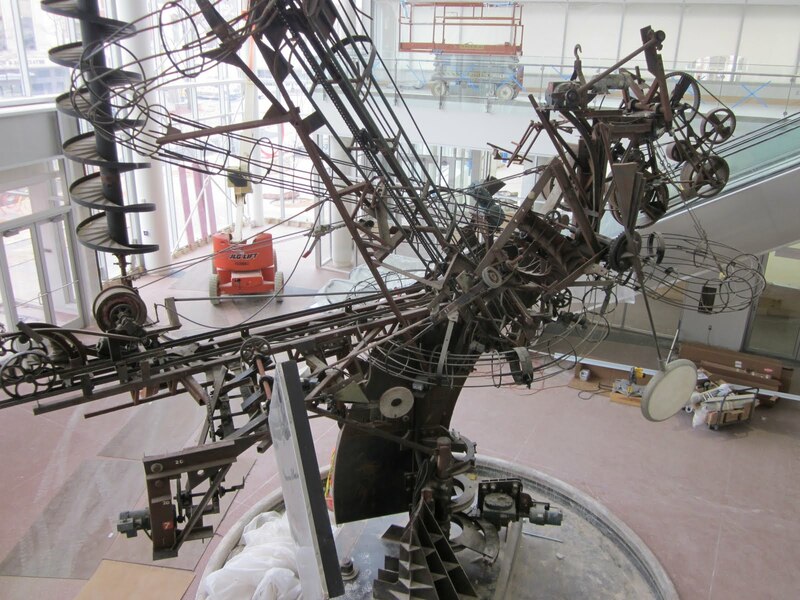 Chaos is a whimsical, yet industrial sculpture that will delight visitors to The Commons. 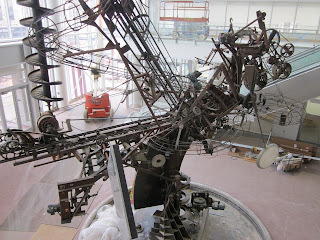 It wasn't yet "moving" when I visited, but eventually all these gadget and gears will come to life in a noisy but fun piece of public art. This will be a place where we can make lots of new family memories in the years to come. (Scheduled to open to the public sometime in May.) Open 7 a.m. to 9 p.m. Monday-Thursday, 7 a.m. to 10 p.m. Friday and Saturday, and 10 a.m. to 8 p.m on Sunday. Admission is free of charge. Events in the performance hall may be require tickets, prices will vary. Insider Tips: Make a day of it. Zaharako's Ice Cream Palor and Soda Shop is directly across the street and makes a really unique place for lunch, dinner or an ice cream treat. Kidscommons, our local children's museum, is also across the street. For more ideas on how to spend your time in Columbus, see my Backyard Adventures page. Thanks to the Columbus Visitors Center for inviting me on a tour of The Commons before it opened. Wow - you are lucky to have a resource like that in your community. Sounds like it will be fantastic. Have you been to the new playground yet? I took my kids when we were in town a couple weeks ago and loved it! I went in resistant because I have fond memories of the old playground as a kid but the new one makes me wish I was a kid again!